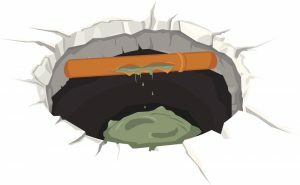 4 Ways You’re Ruining Your Sewer Line | Doug Turner Plumbing CO.
What material is your pipe made of? A lot of homeowners might hesitate before answering this question. It’s more than likely that your pipes are PVC or copper—even newer homes are built with PEX piping. It’s important to know what your pipes are made of in particular because each material has different needs. Not knowing what material pipe is in your home means not knowing what’s safe for your plumbing. Next time you have a professional plumber in your home, ask them to let you know what your piping needs. Admit it, you’ve had a minor clog in your home or a slow-moving drain and instead of calling a plumber you ran to the store and bought a drain cleaner. These types of chemical solutions are terrible for your drain. The chemicals in these cleaners are unbelievably corrosive. This is so terrible for your drain because it may eat away at the clog, but it won’t stop there, it will eat away at your pipe for dessert too. There are certain things that you should never flush down your toilet that we sometimes do—those leftover antibiotics, those luxurious wipes that promise they’re flushable, and even sanitary products. Even though so many of those special wet wipes promise to flush with no problem, this is untrue because of the sludge and other debris that often lines your system. Don’t flush any medication or female sanitary products down either—make sure these make it into the trash if you always want to have a smoothly functioning HVAC system. The best way to ensure that you always have a healthy sewer system is to have a plumbing professional monitor your system when you need it. We know why people hesitate to call for professional plumbing services—the high price tag. That’s why we always make sure that we provide quality service at low prices here at Doug Turner Plumbing CO. If you want to keep your sewer line in great shape this year you can contact our team here at Doug Turner Plumbing CO for reliable, fast service from trained professionals.